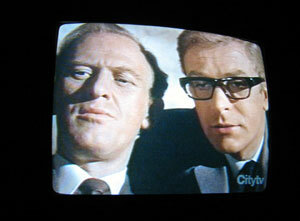 As excellent as the IPCRESS File is, it doesn’t make ideal early morning viewing for the jet lagged and paranoid. “Induction of Psycho-neuroses by Conditioned Reflex with streSS”, i can relate to that! Anyway, John Barry’s haunting theme is now playing inside my head, as Joel says “on my psychic jukebox”. A Whatfettle article by Paul Downey published Tuesday, September 14th, 2004, at 11:08 am under a Creative Commons License.